Giant Mural on Flatbush Avenue Captures the Brooklyn WayBrooklyn artist Katie Merz created a cartoonlike mural on a 12,500-square-foot city building. If You Like the Obamas’ National Portraits, You’ll Love the Artists’ Other WorkKehinde Wiley and Amy Sherald are both up-and-coming portraiture artists. 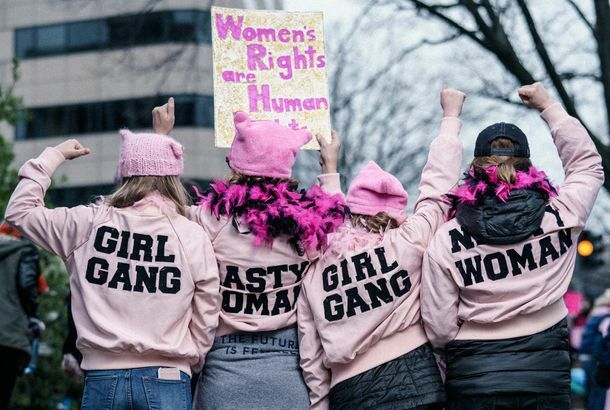 29 People on Why They Showed Up for the Women’s StrikeThey came from as far away as Iran, Denmark, and Queens to join the Day Without A Woman march. Here’s why. See Stunning Portraits From the Women’s March on WashingtonGrace and determination were on full display. The Painting That Jerry Saltz Can’t Stop Thinking AboutKerry James Marshall’s A Portrait of the Artist As a Shadow of His Former Self fires like a time bomb in the mind. 22 Intimate Lost Photos of Marilyn MonroeShot by one of her lovers at the beginning of her career. See Portraits of Skateboarders Around the WorldShot by a 40-something woman who’s a skater herself. A Brooklyn Artist Tackles Femininity (NSFW)I Heart Girl features Jessica Yatrofsky’s photos of dozens of young women. Famous Faces in a New LightRaw, honest portraits by Brigitte Lacombe for NeueJournal. See Striking Portraits of Cool, Artistic New York WomenFor the past five years, photographer Lee O’Connor has photographed women she spots on the streets of New York. 4 Women on the Outfits They Feel Best InThe clothes that make me me. See Zanele Muholi’s Powerful Portraits of the LGBTI Experience in South AfricaZanele Muholi’s photographs aim to increase visibility of LGBTI individuals in her community. Behold the Petrified Face of a Man Who Drives Miley on DatesPortraits in anxiety. See M. Sharkey’s Poignant Portraits of Queer YouthNow on view at the Stonewall National Museum. There’s an All-Women Portrait Intervention at OxfordIn honor of four decades of coeducation. Portrait: Catherine Deneuve, an Icon at 70Five decades after she achieved international acclaim, she is still très belle, non? Racy Kate Middleton Painter Receives Prestigious National Arts HonorAfter painting her pregnant in a bra, Nick Lord will be in the National Portrait Gallery. Heartbreak and the Quantified SelfieThe lovelorn poetry of personal data analysis. Watch How a $200 Steve Jobs Sweatshirt Gets MadeNext-level fandom. Paz de la Huerta on Breakup, Self-Love, and Her New Photo BookPlus, a gallery of the photos taken with her collaborator on the project, Alexandra Carr. Norman Jean Roy Thinks Digital Ruined Fashion PhotographyHe sticks with film when shooting Hilary Swank, Joan Smalls, and former presidents’ portraits for Vogue and Vanity Fair. Kate Middleton Reacts to Her Royal PortraitAlso, Will took her family to the circus on her birthday. What Voting Means to Us: 24 Women at the PollsA photo essay. See a Portrait of Louis C.K. As a Beautiful ZombieFor the empty space on your Zombie Wall.